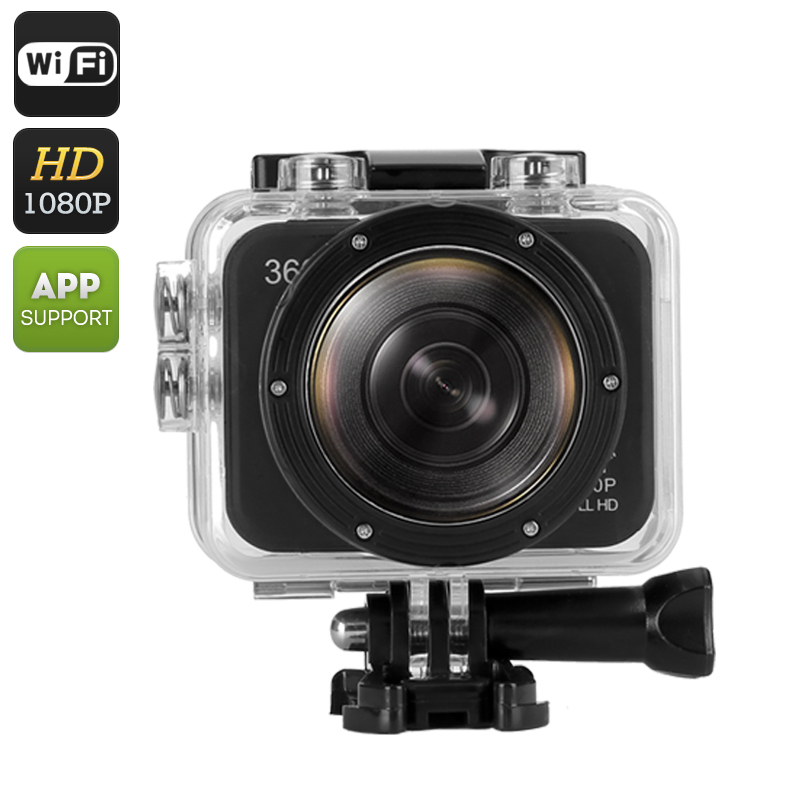 Successfully Added HK Warehouse 360 Degree Panoramic Action Camera - 30m Waterproof Case, 1080P, 180 Degree Fish Eye Lens, 6 Shooting Modes (Black) to your Shopping Cart. Put yourself in the center of the action while capturing the entire world around you. This 360 Degree Panoramic Action Camera comes with all the features and functionality you may expect from a high-end FHD sports camera. With its sturdy, reliable, and compact design this 360 degree action camera is waterproof up to 30 meters with its waterproof case and can be mounted on numerous surfaces. This 360 degree sports camera is designed to capturing that what you like most in FHD quality from an entirely different viewing perspective. With this action camera you can record FHD 1080p footage at 30 frames per second and capture most of the background with its extremely wide 180 degree fish eye lens. This 360 degree sports camera furthermore allows you to snap high quality pictures with its 12MP camera for you to share with all your friends and loved ones once you have returned home from your upcoming adventure. Thanks to its Wi-Fi connection this action camera can be connected to and controlled by any mobile device. Download the free App and gain flexibility in controlling and viewing what you record on your panoramic camera from a distance. This easy to use mobile application allows you to start and stop recording, snap pictures, toggle between shooting modes, and much more. This FHD 360 degree action camera comes with a set of mount accessories and water proof case that allows you to take this camera up to 30 meters under water. Simply mount this sports camera to your helmet, bicycle, or any other sport equipment and you are ready to capture all your upcoming adventures in mesmerizing quality. Whether you use this sports camera for scuba-diving, parachuting, skiing, hiking, or capturing footage from above with your newly acquired drone – this 360 degree camera you can fully immerse yourself in the world and capture that what you like doing most from an entirely new and exciting perspective. This 360 degree action camera comes with a 12 months warranty. Brought to you by the leader in 360 degree cameras as well as wholesale action cameras..
Arabic: - كاميرا بانورامية العمل 360 درجة - Chinese Simplified: - 360 度全景行动相机 - Czech: - 360 stupňů panoramatických akční kamera - Dutch: - 360 graden panoramische actiecamera - French: - Caméra d’Action panoramique 360 degrés - German: - 360-Grad Panorama Action-Kamera - Hebrew: - מצלמה פעולה פנורמי 360 מעלות - Hindi: - 360 डिग्री पैनोरमिक क्रिया कैमरा - Hungarian: - 360 fokos panoráma Action fényképezőgép - Italian: - Azione panoramica a 360 gradi telecamera - Japanese: - 360 度パノラマのアクション カメラ - Korean: - 360도 파노라마 액션 카메라 - Malay: - 360 darjah panorama tindakan kamera - Norwegian Bokmål: - 360 graders panoramautsikt Action-kamera - Romanian: - Camera de actiune panoramice 360 de grade - Russian: - 360 градусов панорамный действий камеры - Spanish: - Cámara de acción vistas panorámicas de 360 grados - Thai: - กล้องพาโนรามา 360 องศา - Turkish: - 360 derece panoramik eylem kamera - Vietnamese: - 360 độ toàn cảnh hành động máy ảnh.